A view of London seen through various perspectives. 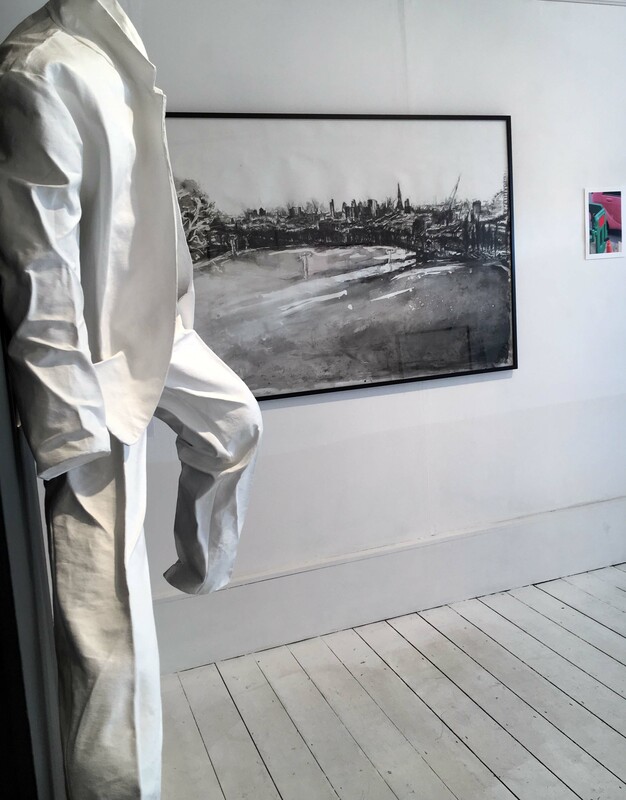 Traditional drawing, instant photography, intricate prints and sculptural pieces, show panoramic views, hidden corners and the cosmopolitan inhabitants that reflect the unique character of this city. 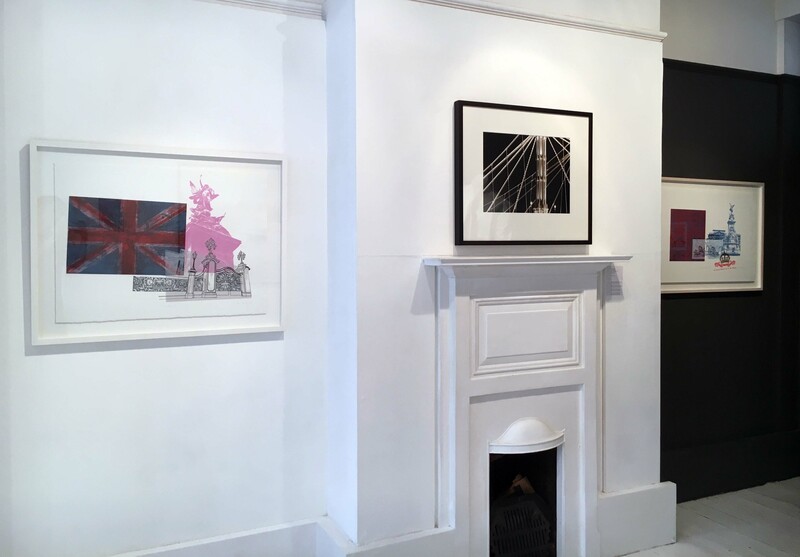 Peter Abrahams’s colourful composite of corners and details of London successfully conveys the essence of the city. 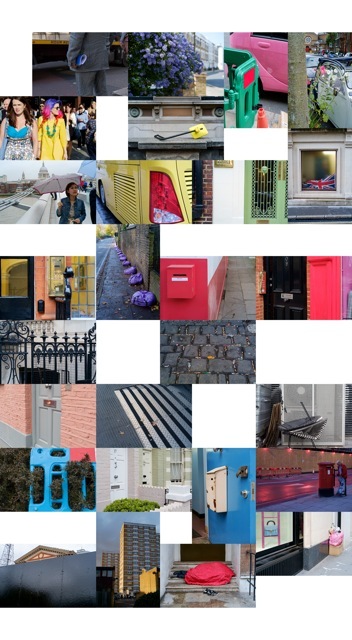 Victorian coloured doors, pin-stripe suits, legendary letter-boxes, grim council buildings, vibrant-haired pedestrians carrying umbrellas in a range of hues and designs are some of the images that form part of London’s kaleidoscope. Conceived as part of a series for Instagram, in these rapid and spontaneous shots, Abrahams continues his investigation of common objects of little conventional value. Whether in his carefully staged still-life works or on these instant images, new interpretations are made possible. Peter Abrahams studied painting at Camberwell School of Art 1979-81 and at the Royal Academy Schools 1981-84. In 1992, he completed a post-graduate course in advanced printmaking at Central St Martins College of Art and Design. 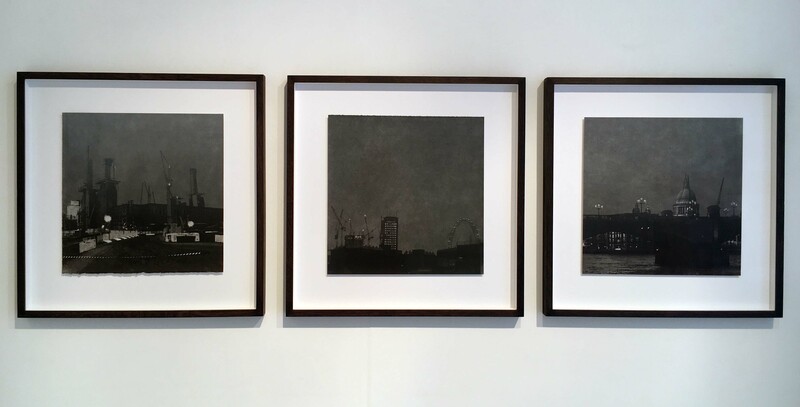 Lucy Bainbridge’s screen prints explore the quiet temporal effect of light on the capital’s cityscape. Photographs are taken of London at different times during dawn and dusk, as the light changes most. By bringing these momentary glimpses into focus, there is a feeling that one can pause the instantaneous rythm of city life. Lucy removes detail and definition from works. 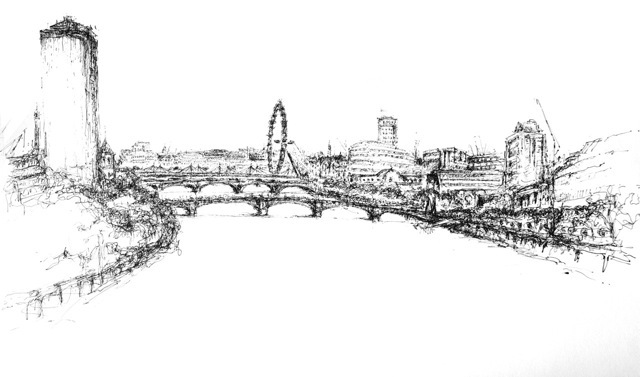 St Paul’s, Battersea Power Station or the Southbank Centre are changed to the point at which they lose clarity, resulting in a combination of organic and formal shapes. 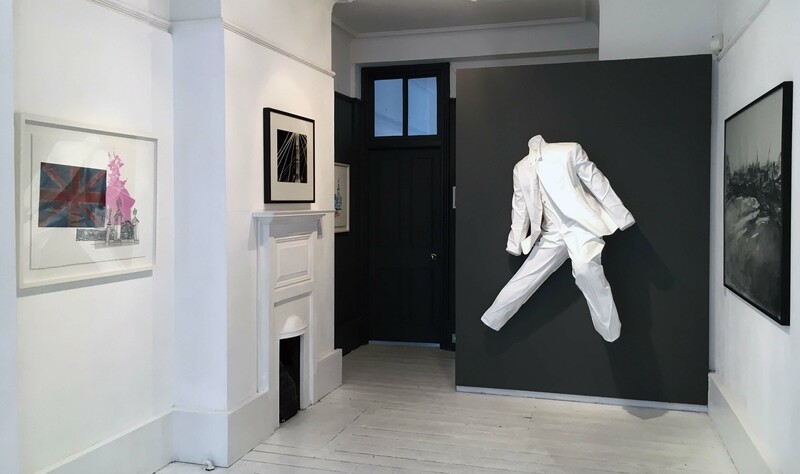 The works reflect a quiet moment of the brief and changing images, leaving space for the viewer to interpret the illusory depiction of the original subject matter. A variety of screen print techniques are used, combined with chine collé and graphite, to create subtle perceptions. 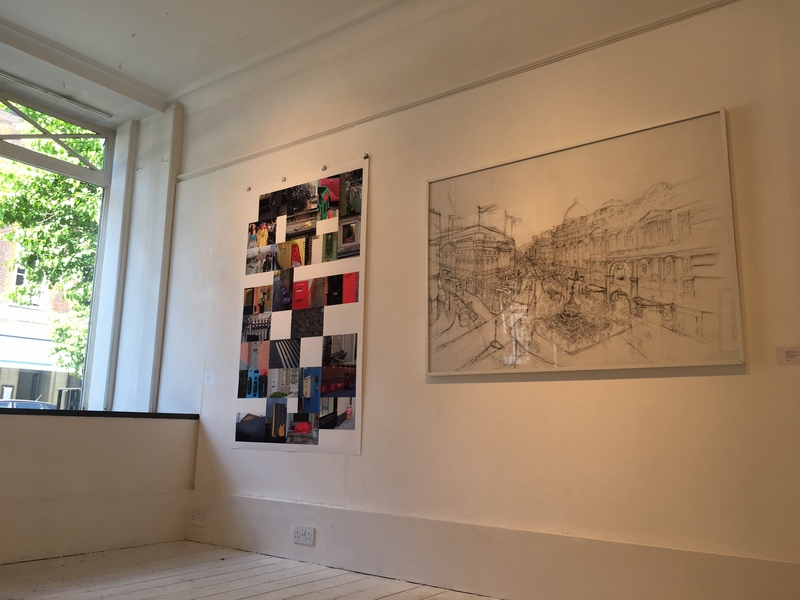 Lucy Bainbridge graduated from Camberwell College of Arts (University of the Arts, London). 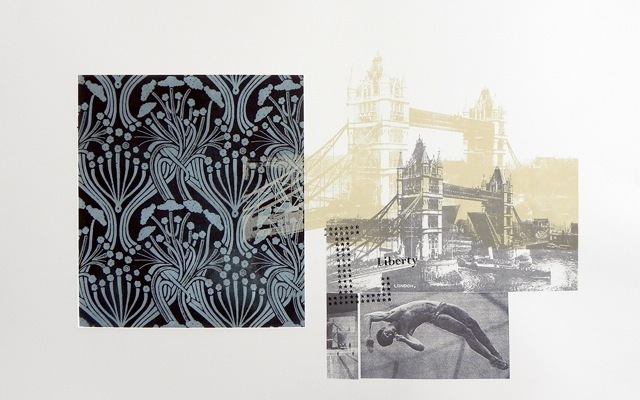 Fabrics from Liberty’s, the British flag, postcards or old stamps are layered with images of the Gherkin, Tower Bridge, Buckingham Palace or other London landmarks. 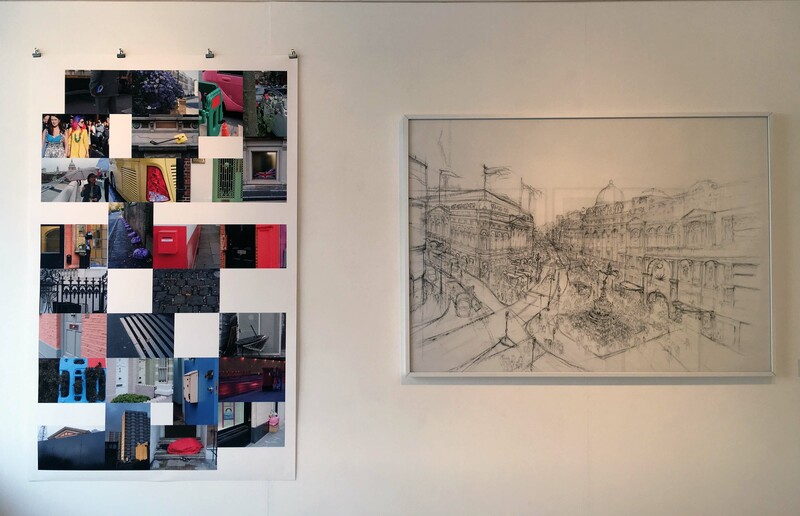 Sara J Beazley explores change in urban landscapes layering collographs and intaglio printing techniques combining found images from architectural drawings, textiles, old postcards and stamps. Sara just completed a commission by Soho House to create a collection of 150 prints for the bedrooms of the recently opened The Ned, London. The project was based around the celebrated architect Edwin ‘Ned’ Lutyens’s works and for this project, Sara photographed many of his buildings and also worked closely with the Lutyens Trust to present unique and tailored pieces for this beautiful designed Grade I listed former Midland Bank. One of the prints is also in the specially curated collection of art in the hotel’s lounge bar, Vault 100. 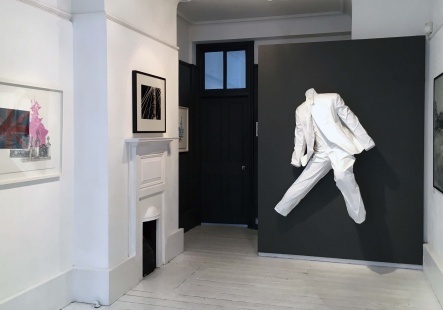 Sara J Beazley earned a Masters Degree from Camberwell College of Art in 2002, and has since lived and worked in London, Hong Kong, New York and Paris. 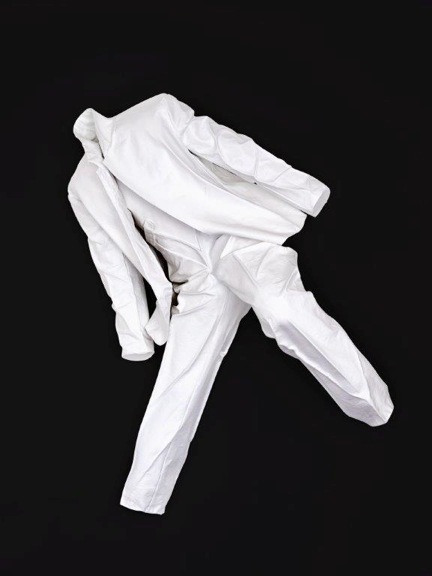 Jane Goodwin’s ‘White Suit” sculpture plays host to the collection of works. 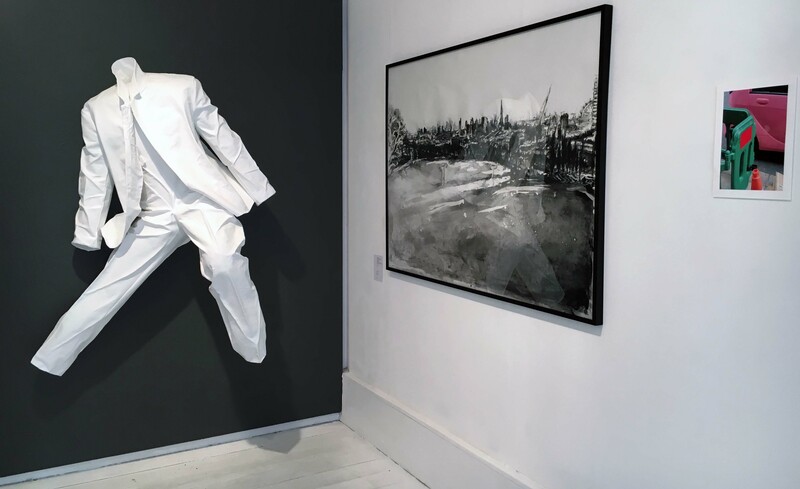 As iconic characters of London as the world’s financial centre, these white suits lean languidly against doorways, sprawl over chairs and lie prostrate on the ground. The animated stylised hollow figures emerge almost ghost like with their faces censored, devoid of personal identity, colour, nationality. With humour and wit, Jane captures the essence of the inhabitant of the Square Mile with these anonymous city traders. Her humour also comes through in her chair sculptures, where she explores the chair’s sculptural qualities and their perceived personalities. 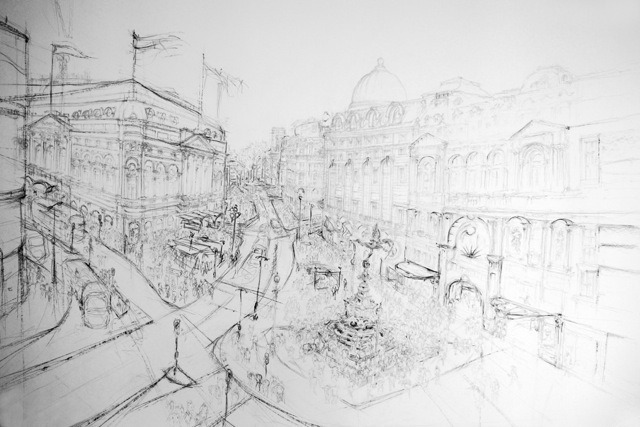 Jane trained at the University of Brighton and Surrey Institute of Art and Design. 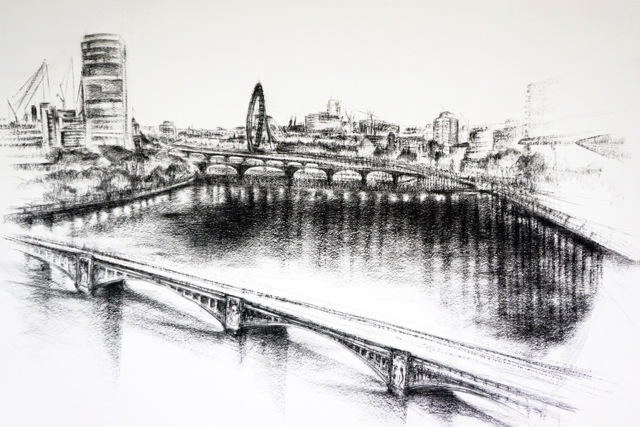 With pencil, ink and charcoal, in a traditional manner, Solange Leon draws and etches many of London’s iconic views. Working outside, often in unforgiving conditions, the artist's dedication is apparent. Devoid of colour, in black and white, the bridges, river and buildings are effortlessly lined out. The liveliness of her line helps to weave the complexity of the movement of both subject and space, creating atmospheric works. Her training as an architect strongly influences her work and her passion for drawing is appreciated in her technical skill. Originally from Chile, Solange Leon lives and works in Sussex. 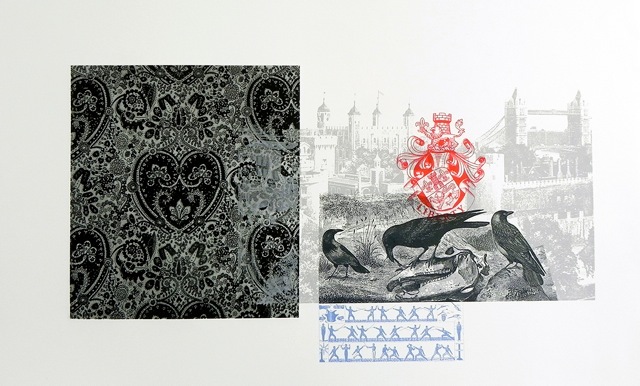 She trained at Brighton in Printmaking and Architecture. A surprising and different view of many of London’s classical landmarks. Stuart Redler, with his unique perspective, captures details of the city which are not obvious to the casual observer. Illuminated sights of London become magical and nostalgic. 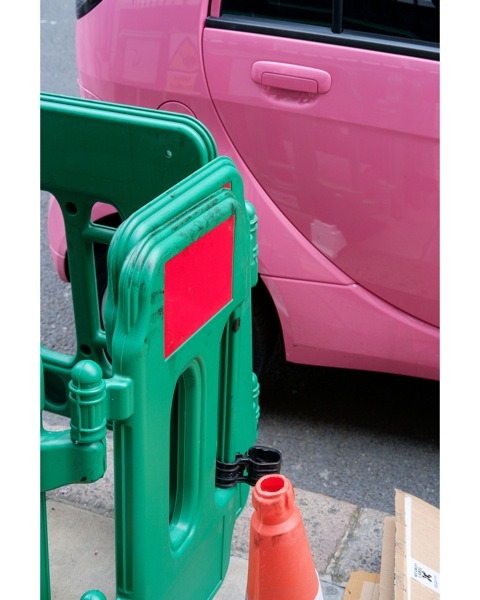 A city endlessly photographed and seen by many of its citizens daily, Redler manages to surprise the viewer and make him re-visit the obvious but with a completely different and unexpected take. The immensity of St Paul’s Cathedral, captured from the south bank, becomes almost a miniature maquette. Lights on the trees appear as millions of surrounding bright stars offering a magical view. 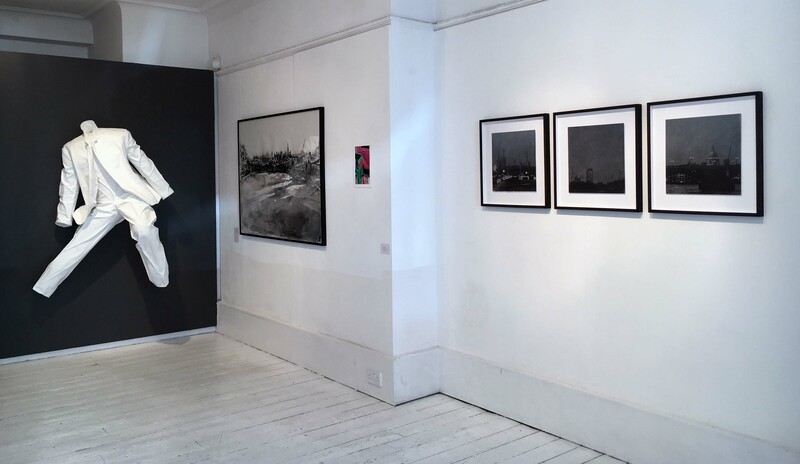 Iconic images of London, such as the Underground sign, the London Eye, the Albert Bridge and Nelson’s Column are stripped off of their familiarity and attain a seductive, mysterious aura. Stuart Redler has received many awards, including six from the Association of Photographers. 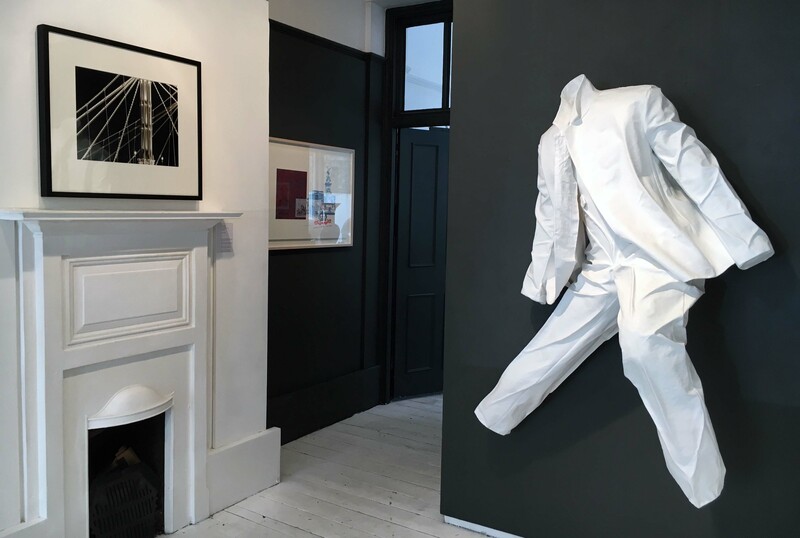 His works are also held in numerous private collections, as well as in permanent collections such as the National Portrait Gallery and the Victoria and Albert Museum in London.